A strong active pony, full of quality and spirit. True pony character, alert, high-couraged, intelligent and kind. HEAD: Neat and pony like, showing no dish. Broad between the eyes, which should be bright and alert. Pony ears slightly incurving. Long foretop of straight hair down the face. NECK: Strong and of ample length. Stallions should display a bold outlook with a well-arched crest. Throat and jaws clean-cut. Long, flowing mane. SHOULDERS: Well-laid, long, sloping shoulders with well-developed muscles. Withers not too fine. BODY: Short-coupled and deep through the chest, with well-sprung ribs. HINDQUARTERS: Hindquarters deep, lengthy and powerful. Second thighs well-developed and very muscular. Tail well set on, not high, with plenty of long, straight hair reaching the ground. HOCKS: Broad, flat and clean. Well let down with plenty of dense flat bone below. FOREARMS: Set square. Short and very muscular, with broad, well-developed knees. FEET, LEGS & JOINTS: The very best of feet and legs, with flexible joints, showing quality with no coarseness. The cannons should display 8 to 9 inches of flat flinty bone and well defined tendons. Pasterns should be nicely sloping and of good length. Ample, silky straight feather on the heels. Large, round feet, open at the heels, with well-developed frogs. HEIGHT: The preferred height range is 14 h.h to 14.2 h.h. (Ponies above and below this range to be placed at the discretion of the Judges). COLOURS: Black, brown, a few grey and bay, and occasionally roan. MARKINGS: A white star and/or snip on the head. White to the fetlocks of the hindlegs only. Mis-marked ponies showing more white than this are registered as section B in the stud book and placed at the discretion of the Judges. ACTION: Clean, high, straight and true. Going forward on all fours with tremendous energy. The knee and hock are lifted, the hindlegs flexed well under the body for powerful drive. Ponies registered in Section X of the stud book may not adhere to the breed standard. 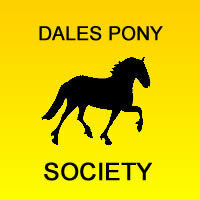 These ponies are not permitted in Dales Pony Classes. A good Dales type should be capable of the carrying out the job for which it was bred, i.e. to pull a plough, trot a mile in around 3 minutes, and still give a good ride to hounds. To this end, the pony must be wide and powerful, with extremely high quality limbs and feet; alert and active, with a high-stepping trot, fore and hind limbs being lifted to the same level and driving powerfully forward. In the interests of welfare, ridden and driven ponies may be body-clipped in the winter, taking the above rule into account. Legs should not be clipped. Ponies which have been clipped in the winter, may be at a disadvantage when shown in-hand the following spring, depending on the Judges view. No plaiting allowed except for the traditional plait at the top of the tail bearing ribbons if so wished. No false hair or make-up of any kind is permitted. Youngstock is usually shown in white halters, and the mares are also traditionally shown in this way, although riding or in-hand bridles are also permitted. 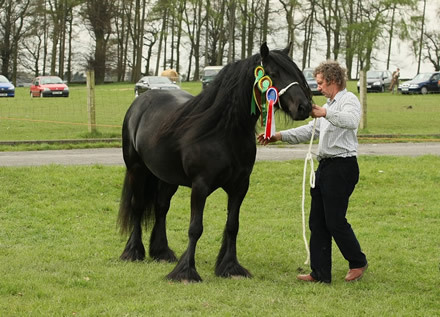 Licensed stallions (three years and over) are traditionally shown in full stallion tack, and this is a rule at the Breed Shows.